Really liked this place, we had two different private en-suite doubles (either side of the W trek) and liked both of them, and had great showers! Common area also good, and staff very helpful, at all times of the morning/ evening. Also went to their sister bar/ restaurant, which is right opposite and had a lovely meal. definitely recommend. Great place. Everybody that sleeps here goes to Torres Del Paine in the morning, so if you sleep in dorms you’ll be woken up around 5 by other travelers. But why would you be in Puerto Natales if it’s not to go to Torres Del Paine, seriously? 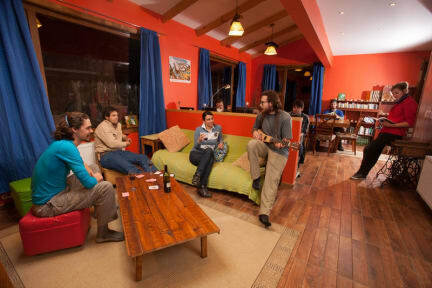 Really great hostel! Friendly staff. Short walk from the bus station. Free breakfast with eggs, toast, jam/butter, tea and coffee, was okay. Really cool lobby and common area, free board games & cards available to use. Room & bathroom were really nice. Very welcoming and friendly staff, always makes a difference for a solo traveller. Comfiest hostel I've stayed in in South America so far. Clean and helpful staff. Would recommend. IT was great except for the hall lights that shined into our window. We were in room #1 so it was really bright. Maybe curtains on the window could fix that. Only spent the night but hostel was very comfortable and clean. Breakfast was nice too. Stayed before and after doing the W Trek. Being able to leave excess luggage here for the trek was a big plus for me. Good breakfast and decent common area. Pretty quiet in the evenings probably due to most heading out for hikes or treks the next day. I'd stay again no problem, staff were helpful and easy going. Pros: Very clean and cleaning ladies are very nice. 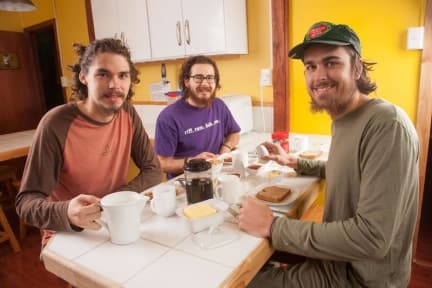 Breakfast is ok. Cons: They won't try to help you at all, they charge to keep your bags while you're trekking (other hostels don't) and it lacks atmosphere. They were selling some trekking and camping gear and everything was so expensive they had to take it down. Not a good place to meet travellers. Overrated and expensive.